Is the theme of the 7 Sins online slots game a little ironic within the online gambling environment? Maybe, but it’s a universal topic that resonates with all players, guilty of these sins or not. While it might be touching on a dark theme, software providers, Play’n Go, give it a light-hearted feel with bright colours, beautiful graphics, and a soundtrack that creates a dramatic effect throughout the game. To find an online casino in Canada that offers this guilty pleasure of a slot, simply search for one that features Play’n GO games. 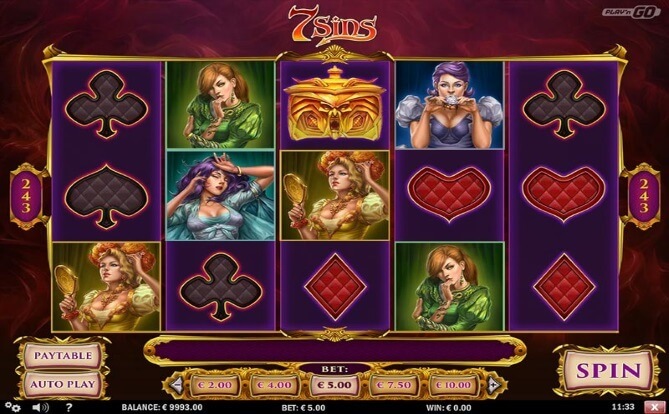 You might find yourself doing a little soul-searching when confronted with the vices portrayed in the 7 Sins online slots game, depicted in the imagery. The creative team at Play’n GO designed seven female characters, each representing one of the sins: envy, greed, wrath, gluttony, pride, sloth and lust. Both beautiful and seductive at the same time, they display against differently coloured backdrops and vary in value. There’s no shortage of payout opportunities in this 5-reel 243-ways-to-win game with Wilds, Scatters, Free Spins and a Bonus feature boosting your chances. Let’s take a look at the symbols first. The traditional card suits – found at all online casinos – spades, hearts, clubs and diamonds, can help you pocket symbol combo winnings. Worth even more are the symbols of the seven women, depicting the seven sins – that’s if you find 3 or more in a winning combination. Also keep an eye out for the online slot’s Wild symbol, or rather, 2 Wild symbols. The first is your standard Wild, with a devilish 7 in the symbol. The second is a Double Wild, with 2 x 7s in the symbol. What makes this symbol special and sought-after is that it acts as two Wilds when it substitutes, adding value to your payouts, and increasing the standard max number of matching symbols from 5 to 7, for a super big win. The Scatter in turn is depicted by a Golden Chest symbol. If you find three Scatters, it will trigger a round of 7 Free Spins with increasing Multiplier values. During each Free Spin, one sin is showcased and the middle reel becomes sticky and expands to boost your payout opportunities. Should you only find 2 Golden Chest Scatters, you’ll launch the online gambling machine’s Second Chance feature, giving you exactly that, another chance to win. During this round you’ll get to pick one of the seven ladies, each hiding a decadent Multiplier value. 7 Sins can be found at Casino Cruise as well as other online casinos, offering games from Play’n GO. 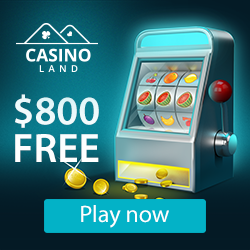 What makes this an online casino players in Canada should consider signing up at, is without a doubt its mega welcome package €1000 + 200 Free Spins, along with a line-up of over 1300 star-studded online slots, table games and live casino options.